This map and guide provides information on water access sites, facilities, and cultural and historic information along 41.8 miles of the Monocacy Scenic River, from Rocky Ridge on Maryland Rt. 77 to the Potomac River. This colorful guide is printed on waterproof, tear proof paper and was designed primarily for those touring by kayak or canoe. The water trail has been divided into three segments which allows visitors to make their trips shorter or longer according to their time and ability. 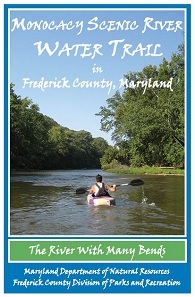 The guide is available by request or download from the Frederick County Division of Parks and recreation.